Minimum Wage Loses Ground Since Its Banner Year In 1968 : It's All Politics When President Lyndon Johnson launched the War on Poverty 50 years ago, part of it was a pushed to increase the nation's minimum wage. Low-wage workers actually saw their purchasing power peak while Johnson was in office. 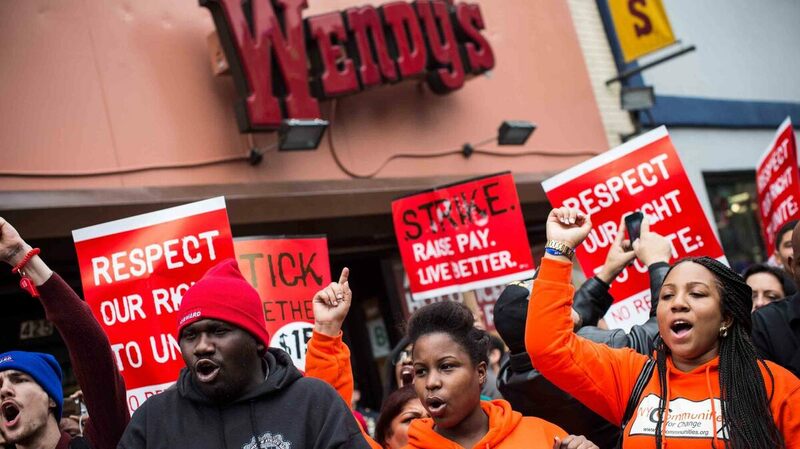 Protesters rally outside of a Wendy's in Brooklyn, New York, on Dec. 5 in support of raising fast food wages from $7.25 to $15 per hour. This week, we've been looking back at the legacy of the "War on Poverty," launched by Lyndon Johnson 50 years ago. The arsenal included government programs such as Head Start, food stamps and a push to increase the nation's minimum wage. "We must extend the coverage of our minimum wage laws to more than 2 million workers now lacking this basic protection of purchasing power," Johnson said. Low-wage workers actually saw their purchasing power peak while Johnson was in office. Adjusting for inflation, minimum wage workers earn less today than they did in the late 1960s. In 1968, workers on the bottom rung of the economic ladder that year earned the equivalent of well over $10 an hour in today's money. But purchasing power of the minimum wage fell sharply in the 1980s, and it still hasn't recovered lost ground. Devonte Yates, who works at a McDonald's in Milwaukee, says he sometimes struggles to pay for groceries and other bills. "I have heard a lot of things like, you know, fast food restaurants or retailers don't really deserve to make more than $7.25," he says. "But I feel that it's a job, just like every other job. So I feel that if we work so hard, we should be able to afford basic things." Economist Lawrence Mishel of the left-leaning Economic Policy Institute argues the problem for low-wage workers, like Yates, is not a lack of productivity or effort. While economic growth has slowed since the 1960s, even today's modest gains are not finding their way into the paychecks of the poorest workers. "I believe we have a wage deficit, not a skill deficit," Mishel says. "Low-wage workers are far more educated and productive than they were in 1968, yet their wages are less." Much of the recent debate over income inequality has focused on the outsized gains by the richest 1 percent. While those fortunate few are racing ahead of the middle class, those at the back of the pack are falling further behind. In the late '60s, the minimum wage was about half of what an average employee made. Today, it's dropped to just more than a third. Mishel says boosting the minimum would help to close that gap. "We are never going to get a growing middle class and more people into the middle class unless we have broad-based wage growth. And this is the single, simplest direct instrument we have for obtaining that." Last year, President Obama called on Congress to increase the minimum wage and add automatic cost-of-living adjustments. White House economic advisor Jason Furman says Obama is concerned by the twin problems of sluggish growth and uneven distribution. "When the president spoke about the topic of inequality, he said the first thing you need to do is grow the pie more quickly, increase your productivity growth," Furman says. "And secondly, you need to make sure that the pie is shared more fairly." A Quinnipiac University poll released in December shows that about 70 percent of Americans support raising the minimum wage — and that more Republicans support it than oppose it by a narrow margin. So far, though, congressional Republicans have shown little interest. House Speaker John Boehner has warned that raising the minimum could discourage employers from hiring additional workers. And Florida Sen. Marco Rubio argued this week that the focus should be on helping workers move up into higher-paying positions. "Raising the minimum wage may poll well, but having a job that pays $10 an hour is not the American dream," Rubio said. McDonald's employee Yates does have his sights set higher: He's studying to be a probation officer and maybe one day a lawyer. In the meantime, though, he's dependent on his fast-food paycheck. If it were a little bigger, he says, both he and his co-workers would have an easier time getting by. "It's not like people are trying to be greedy and want fancy cars and fancy clothes. No," he says. "It's just people work so hard they should be able to have these basic things to be able live." Twenty-one states already set minimum wages higher than the federal government's, though none as high in real terms as the national rate in 1968.